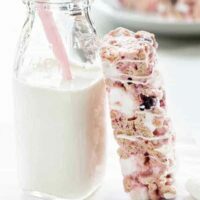 Berry Cereal Treats are everything you love about marshmallow cereal treats, but with a berry twist. They’re simple, delicious, and the perfect recipe to make with your little one. Elle has officially become a lover of the color pink. And as shocked as I am to admit this, I’m kind of into it even though I am not a huge of the color myself. Last week, she had her first dance class and scoffed at the sight of black tap shoes the school provided. With her arms crossed and brows all furrowed up, she stated, Mommy, these shoes aren’t pretty. They’re not pink! Once we knew she loved dance class, I was totally that mom searching the interwebs for baby pink tap shoes – which, by the way, I figured would totally be a thing. But they’re not. All of the pairs I’ve come across are from a company in Europe and were not in her size – even eBay was a bust. So, we settled on a new black patent pair from Target to go with gray leggings with pink flamingos. I tell ya, it’s all about compromise. 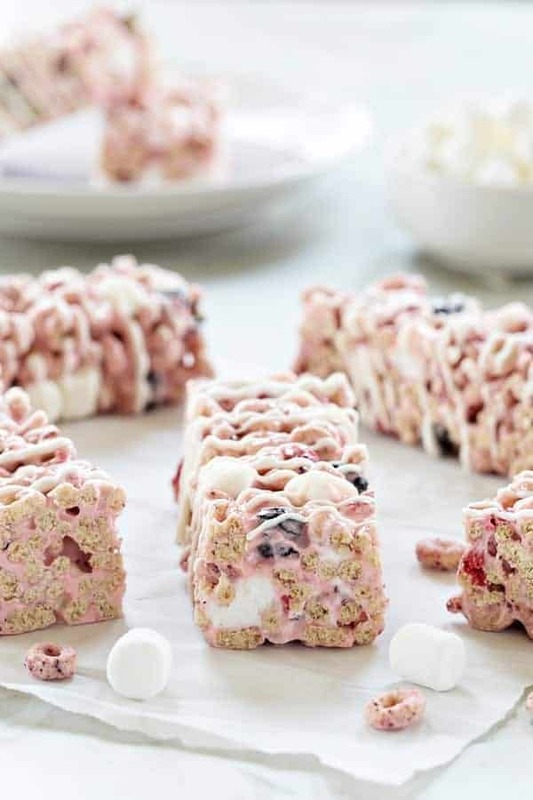 To celebrate her doing so well at her first dance class, we decided to whip up a batch of marshmallow cereal treats, but – you guessed it, she wanted them to be pink. I just so happened to have a fresh box of Very Berry Cheerios in the pantry and decided to pair them with a package of dehydrated berries that I picked up for her to snack on. If you’ve never had dehydrated berries, add them to your grocery list immediately. They’re slightly tart, crunchy and perfectly sweet. We love adding them to yogurt, cereal, or just eating them straight out of the bag for a little snack. When I went into the pantry to grab a bag of Campfire® Mini Marshmallows, I came across one lonely bag of Campfire® CupidMallows and decided they’d be the perfect shade of pink. And since we can’t make marshmallow cereal treats without adding in extra marshmallows, we threw some Campfire® Mini Marshmallows in just before we spread the mixture into the pan. My friend Amber taught me this trick years ago and I’ve never looked back. I mean who doesn’t love an extra gooey, marshmallowy treat with pops of whole marshmallow?! 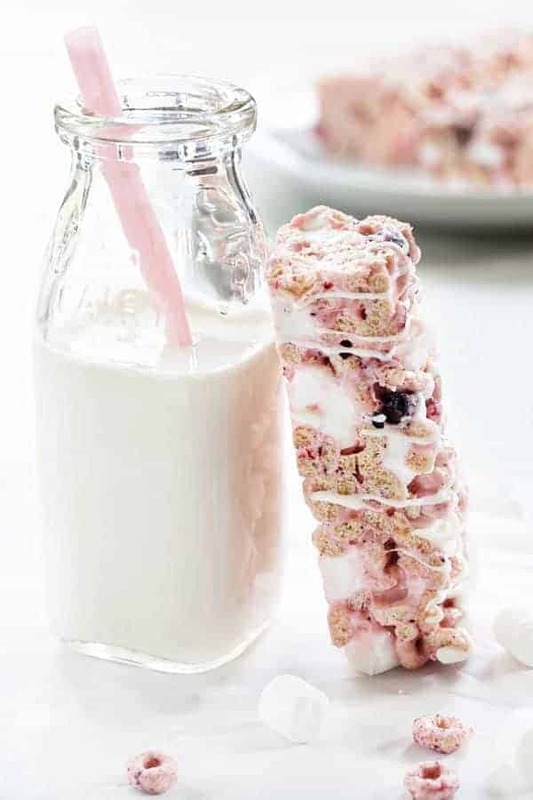 The beauty of these cereal bars is that you can customize them with pretty much any flavor cereal and marshmallows, so if you can’t find the CupidMallows, no worries because any 10-ounce bag of marshmallows will do. 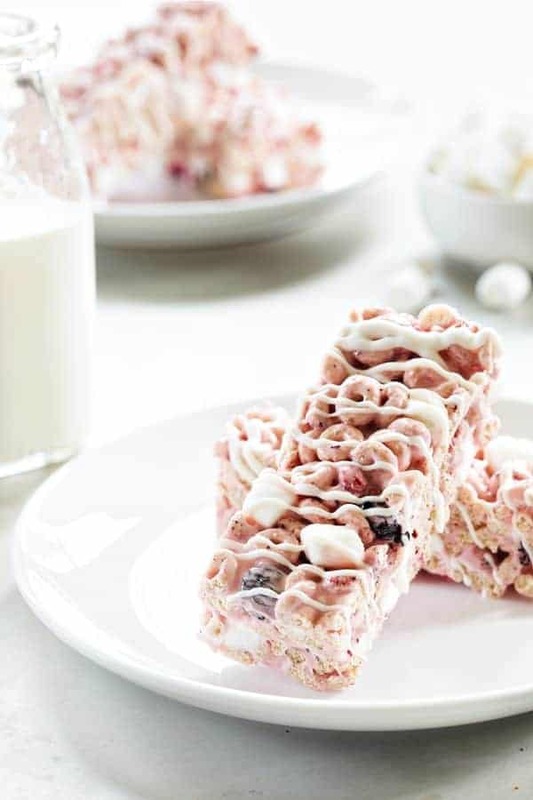 We immediately fell in love with these Berry Cereal Treats, but we’re already talking about fun combinations for next time. I could see adding chocolate chips at the last minute, or even dipping them in a little melted dark chocolate. Nothing like gilding the lily, right? 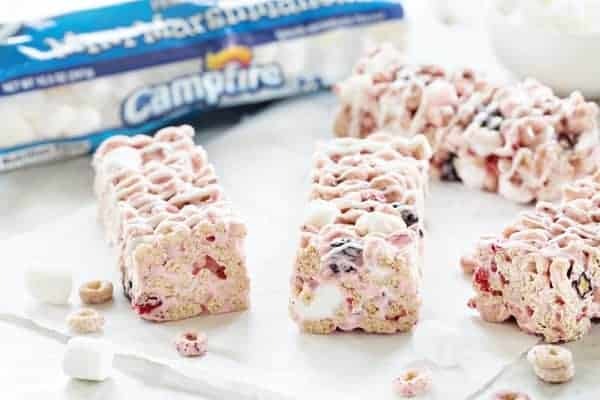 If you’re looking for more marshmallow cereal treats, be sure to check out the S’mores Marshmallow Crispy Treats and these Birthday Marshmallow Cereal Treats. Both a fun way to take your cereal treats to a whole new level! Line a 9 x 9-inch* baking pan with parchment paper or foil and spray with nonstick cooking spray. In large pan, melt butter over low heat. Add the marshmallows to the pan and stir until completely melted. Stir in the vanilla and remove pan from the heat. Gradually add Cheerios; stirring until well coated. Stir in the dehydrated berries and mini marshmallows until thoroughly incorporated. Use a buttered spatula or clean hands to firmly press the mixture into the prepared pan. 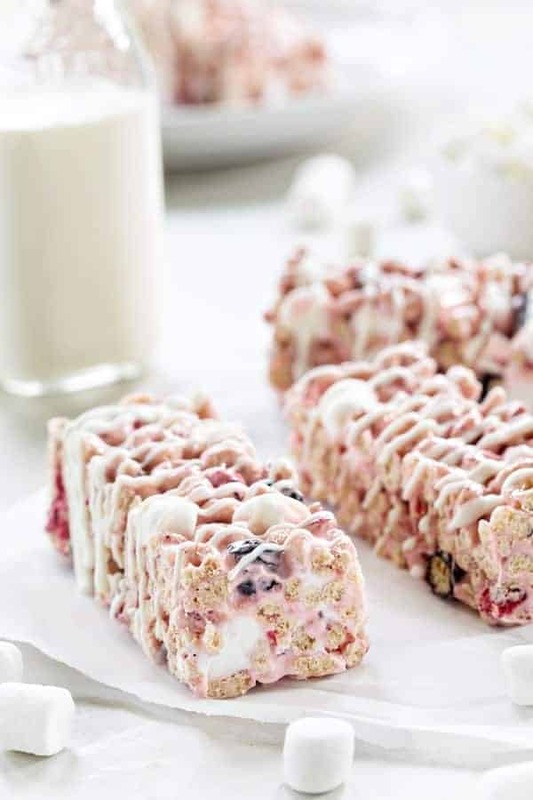 If desired, drizzle Berry Cereal Bars with melted white chocolate. Allow chocolate to harden before serving. I know my grands would love these…heck, I’d love these for a morning treat! Let me know how you like them, Susan! I love pink and I love marshmallows….this recipe is my jam!! This post has all my favorites!! Baking, pink, and dance class! I danced for 11 years of my life so I loved reading about your little one starting dance class! I love this great idea for this recipe! I will have to try! I hope you enjoy them, Autum!